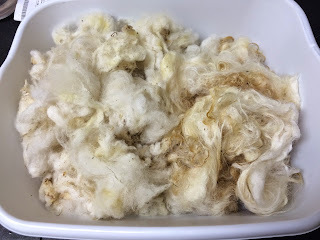 My Firsts: Fleeces and Supported Spindle by TheDancingGoats! Left: Flicked Churro locks, rolled up into faux rolags. Right: Osage orange/hedge apple Russian spindle and vortex talking bowl from The Dancing Goats. 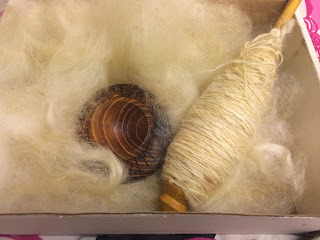 The spindle has some of the Churro fleece, spun from the lock, on it. I discovered The Dancing Goats when I was looking up videos on Russian and Orenburg spindles. I had no intention of buying one, because I wasn't interested in using one, just in their aesthetics and their traditional and historical use. 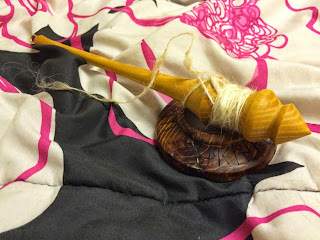 But I found his tutorial on spinning with a "compromise" Russian spindle, based on Russian spindles but with a hook. They are also much bigger and when I looked up The Dancing Goats on Ravelry I saw people in love with their bowls, but very little information on their spindles. 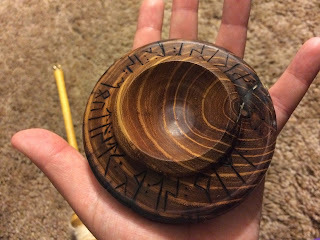 A couple people mentioned the spindles looked huge and clunky, but the overall look and the hook enchanted me, so after a while I ordered one, then a customized "talking bowl" with Tolkien-style runes. They both got there very quickly, about 3 days after the bowl was finished. Actually, they arrived the same day my fleeces did! I was super excited to work with the fleeces, so I washed them that day, and also super excited for my new spindle. Freshly arrived spindle and support bowl! Yes, it's big, but it's also very lightweight, and the bowl is far more beautiful than in the photo. 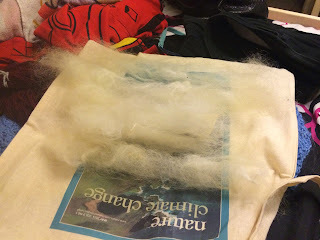 I've been spinning the Navajo Churro fleece using different techniques on it. 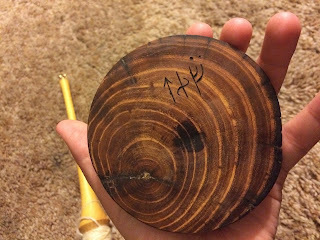 At first I had to do a lot of park-and-draft-type spinning, but I got the hang of it after a bit and I am in love with this spindle. It's rivalling my love for my Miss Marple's Teacup from Greensleeves, plus it's super portable! 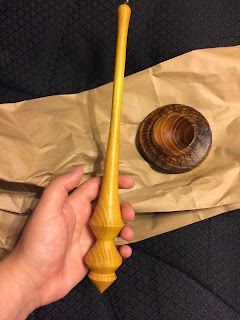 I do intend to buy another, given how magical this spindle is and how in love I am with it. I mean, just look at these spindles! He's also got other compromise spindles in his shop- Tibetan and Southwest (based on the Navajo spindle), as well as drop spindles. Some of the drop spindles run up to quite heavy, about 3.5 oz, great if you're plying or making bulky yarns, the latter of which I've found incredibly difficult on my 1.5 oz drop spindle. There's also those beautiful spinning bowls, as well as wonderful woodworks. Did I also mention that the woods for the bowls and the spindles are discards from cabinet making? Love anything that makes use of recycling or using up every possible resource. On the fleeces, I went and bought an Ashford flicker on a trip to a nearby LYS. I was combing the Churro with a simple dog comb before, but this is...WOW. Just wow. I can see the advantages to both methods, of course, but for this fleece the flicker has done the rest!